Five children who go to the The Little Red School House Too have fallen ill, and unvaccinated kids must stay at home for 21 days, but the Maine CDC has not issued a health alert. A Westbrook day care center has reported a chicken pox outbreak in which five children have been sickened by the infectious disease, and some other children will be kept out of the center for 21 days. A staff member at the center declined to comment Wednesday, and the center’s owner, Rebecca Palmer, did not respond to messages. After the Portland Press Herald obtained the email identifying the location of the outbreak, the Maine Center for Disease Control and Prevention confirmed that there were “several cases” of chicken pox at The Little Red School House Too. Maine CDC spokeswoman Emily Spencer said the agency did not issue a “health alert” about the situation. Health alerts provide notice to health care professionals across the state that an outbreak has occurred so they are aware of infectious diseases that are circulating. An outbreak is defined as three or more cases of an infectious disease being reported at one location, such as a school, day care center or restaurant. The Maine CDC worked with the Westbrook day care center on informing parents about the outbreak, including an information sheet on the disease. Spencer said she couldn’t comment on whether the outbreak started in an unvaccinated child whose parents opted out of immunization on religious or philosophic grounds, which parents are permitted to do under state law. The Little Red School House Too has a capacity of 100 children, according to Maine Department of Health and Human Services licensing information. Chicken pox, or varicella, is extremely contagious. In many cases it leads to mild symptoms, but in some cases it can be a severe infection requiring hospitalization. Children can be vaccinated for chicken pox starting at age 1; infants less than 1 year old are too young to be immunized. Maine parents can opt out of having their children receive required vaccinations for school or day care by signing a form indicating they have philosophic or religious objections. It’s not clear what the opt-out rate is for Maine children in day care; however, in the past several years the state has consistently had one of the highest vaccination opt-out rates in the nation for children entering kindergarten, according to the U.S. Centers for Disease Control and Prevention. Maine’s voluntary opt-out rate for https://www.pressherald.com/2017/07/16/more-maine-kids-arent-vaccinated-new-data-show/?rel=related" rel="nofollow - children entering kindergarten in 2016-17 was 4.8 percent, the seventh-highest in the nation and more than double the national average of 1.8 percent. Myths about vaccines causing autism have persisted since 1998, when a since-retracted study in a British medical journal incorrectly claimed a link. Numerous studies since then have proven there is no connection between autism and vaccines, and that vaccines are overwhelmingly safe. There have been 66 reported cases of varicella in the state through April of this year, according to the Maine CDC, slightly above the five-year average. There were 196 cases in all of 2017, and 228 cases in 2016. Dr. Laura Blaisdell, a Yarmouth pediatrician, said the disease has been preventable since the vaccine was introduced in the 1990s. 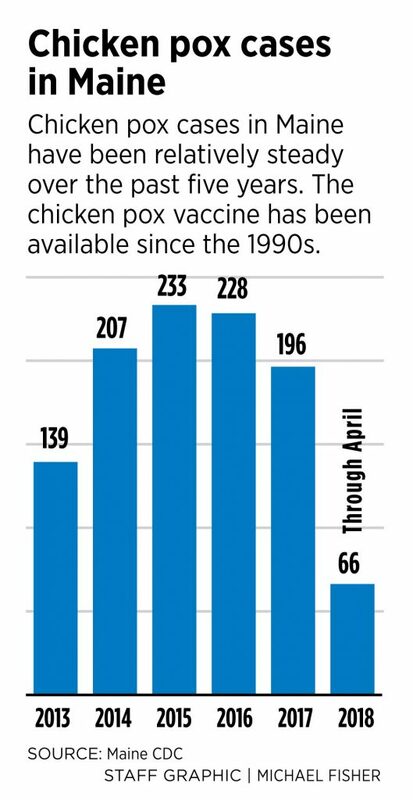 Nationwide, there were about 4 million cases of chicken pox per year in the 1990s before the vaccine was introduced, resulting in about 10,000 hospitalizations annually and about 100 deaths, according to the federal CDC. Recent national data is lacking because some states do not report chicken pox cases, but the federal CDC estimates that the vaccine has prevented at least 3.5 million cases of varicella every year. “It is an entirely preventable disease. We don’t need to have chicken pox circulating in our environment,” Blaisdell said. She noted that for a day care center, having numerous children out because of sickness is not only a medical problem, but also a financial hardship for working parents and the business. A bill to make it more difficult for parents to opt out of vaccinations required for schools and day care centers – by mandating that parents obtain the signature of a health professional – was vetoed by Gov. Paul LePage in 2015, and https://www.pressherald.com/2015/07/01/house-fails-to-override-lepages-veto-of-stricter-vaccine-rules/?rel=related" rel="nofollow - the Maine House that July fell five votes short of overriding the veto.